Newsletter – Chesapeake Chapter U.S.L.H.S. 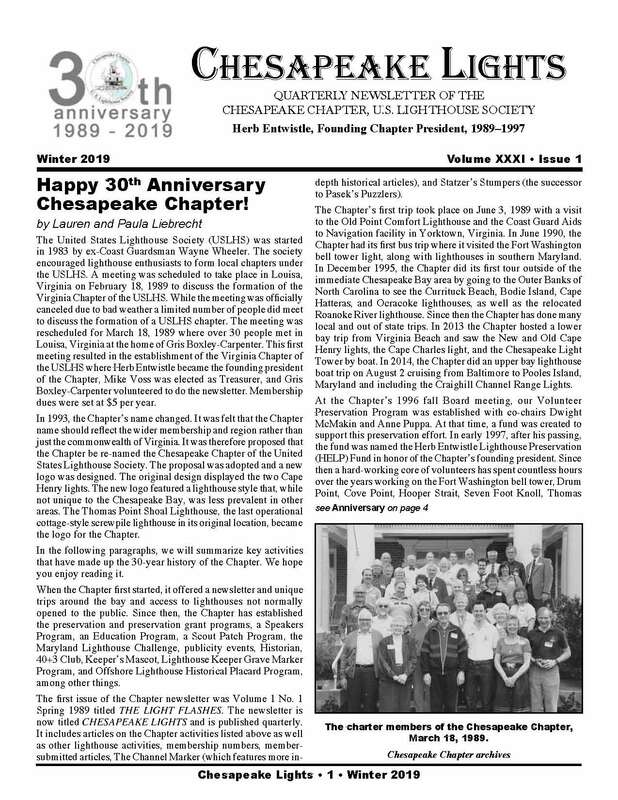 Our members receive a quarterly newsletter, CHESAPEAKE LIGHTS and a monthly email “News Flash”. Our newsletter includes reports of past and future meetings, articles on area lights, member activities and profiles, and other items of interest to lighthouse enthusiasts. The Chesapeake Channel Marker is published periodically as material is available. A channel marker is a device showing a navigable passage. 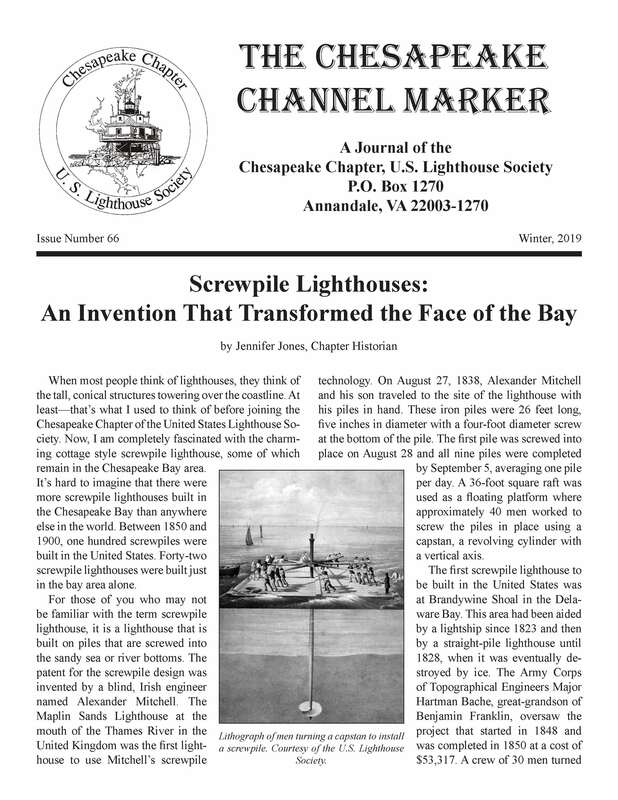 That is what this publication endeavors to be — a device that provides one passageway for Chapter members to gain information that enhances their knowledge about and enjoyment of lighthouses and all lighthouse experiences. If you would like to contribute to this publication, contact the Editors. Layout by Marie Vincent, design by Jerry Waters. Concept origination by the late Dwight McMakin. The eNews provides time sensitive information about lighthouse events in our area, as well as upcoming preservation dates and trips updates. Chapter members: To subscribe to receive eNews, submit this form. Some emails are returned every month because email providers consider the eNews “spam”. Something you can do to ensure your monthly eNews doesn’t get “canned” is to add communications@cheslights.org to your email “safe list”. Remember to notify us of any change in your email address so you don’t miss out on an important update. Non Chapter members: Join today! Go to our membership page and sign up using PayPal and enjoy the benefits of being a Chapter member. We welcome information regarding lighthouse events in your area.